The International League announced their All-Star selections today, and the 30-man roster included two members of the Pawtucket Red Sox: pitcher Anthony Ranaudo (pictured, right) and catcher Christian Vazquez. The 27th Triple-A All-Star game will pit the best from the International League against the best the Pacific Coast League has to offer and will take place July 16th in Durham, NC. 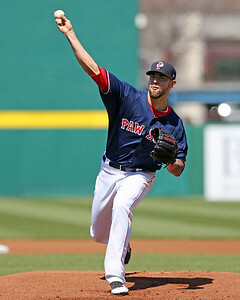 Ranaudo, currently ranked fifth on the SoxProspects.com rankings, has had a dominant first half for Pawtucket. He currently sports a 2.35 ERA, 1.16 WHIP, and 81 strikeouts against 42 walks over 95 2/3 innings. His last 10 starts have been even more impressive, only allowing 10 total runs over 62 innings. Ranaudo has seen his stock rise and fall since he signed in the first round in 2010 out of LSU, and the culmination of those struggles was a 2012 season where he was only able to make nine starts and finished with a 6.69 ERA over 37 2/3 innings. In 2013, Ranaudo returned to full health and was able to put the difficult 2012 season behind him, advancing from Portland up to Pawtucket while flashing the potential that made him a first round pick. Between the two levels he was able to cap the year with a 2.96 ERA, 1.14 WHIP, and 127 strikeouts to 47 walks over 140 innings. It seems his stock continues to rise, and after twice earning pitcher of the week already in 2014 he gets a well deserved All-Star nod. Vazquez (pictured, left) has been widely regarded as the best defensive catcher in the Red Sox system and one of the best in the minors for quite some time. It was largely because of this defensive ability that he also found himself as a Eastern League and SoxProspects.com All-Star in 2013. Once again carried by his elite defense, he has found himself on another All-Star team as he continues to work his way up the system latter and gets closer to the big leagues. His offense has been a work in progress, but overall this season he has put up solid offensive numbers for a catcher, where the offensive standard is lower than other positions. To date he has put up a .275/.331/.384 line with three home runs and 19 RBI over 229 at-bats. Vazquez is coming off his best offensive month of the season, hitting .299/.368/.481 in June. He currently ranks ninth on the SoxProspects.com rankings, and continued production at this level only increases his chances of getting to Boston sooner rather than later. The Cree Triple-A All-Star game will be shown on MLB Network with coverage beginning at 7 pm on July 16th.